Looking at the architecture above you can get a visual idea of the flow of our solution. As publishers, players publish messages to a topic within Cloud Pub/Sub. Pub/Sub will handle messages and any subscribed players will receive the message. 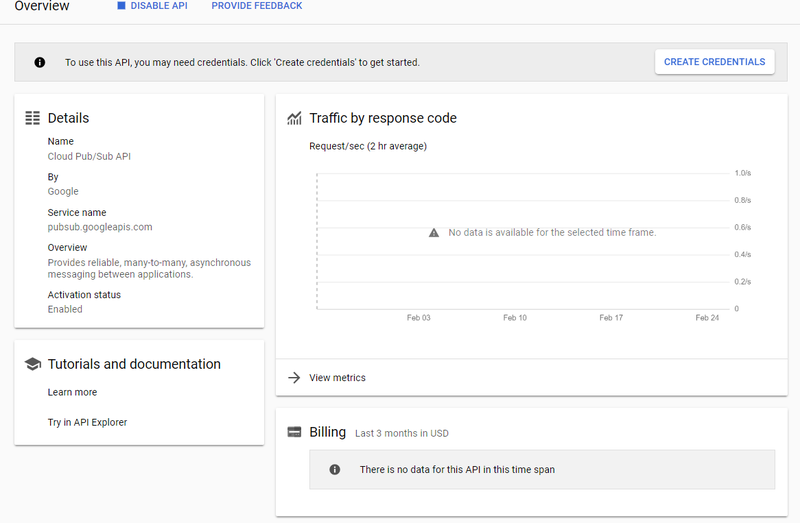 Let’s start building out the game chat and take a deeper look at Google Cloud Pub/Sub. 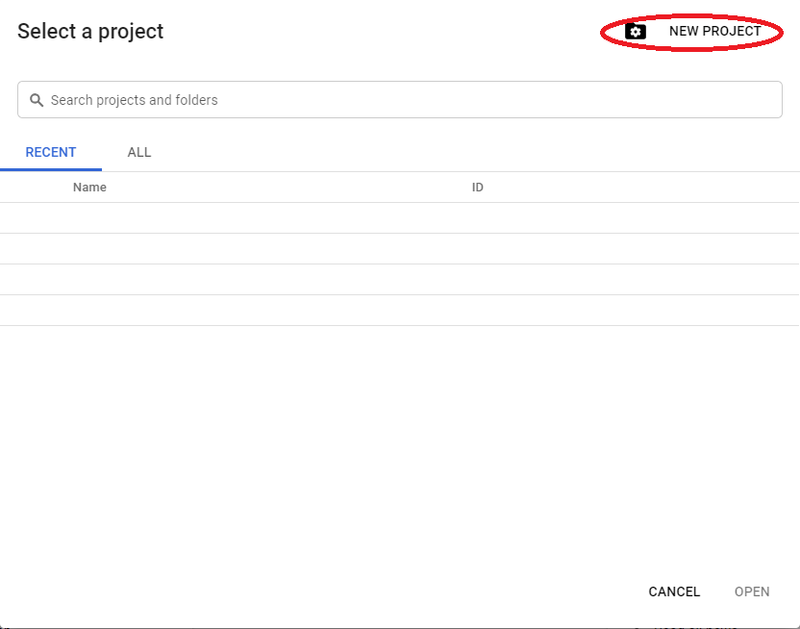 To use Google Pub/Sub, create a new project on Google Cloud Console. Take note of the Project ID after successfully creating your project. You’ll be using it later in the solution. Once the project is created, enable the Pub/Sub API in the API Library. Pub/Sub requires authentication for use so select Create Credentials. 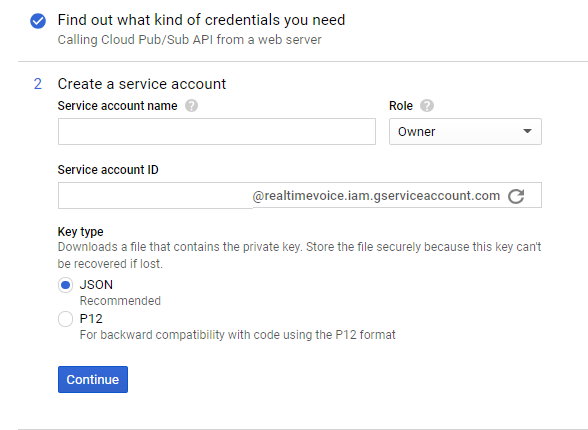 For role it is recommended you add the proper role permissions for each API (in case your service account file becomes compromised) but for this example use Project->Owner. Name your service account download the service account key file. Store it in a safe location you can find easily. To use this service account, set an environment variable using the commands in the images below. Once we have completed these steps, we are ready to build out our chat. We will go through all of the steps to add Pub/Sub functionality to your chat. 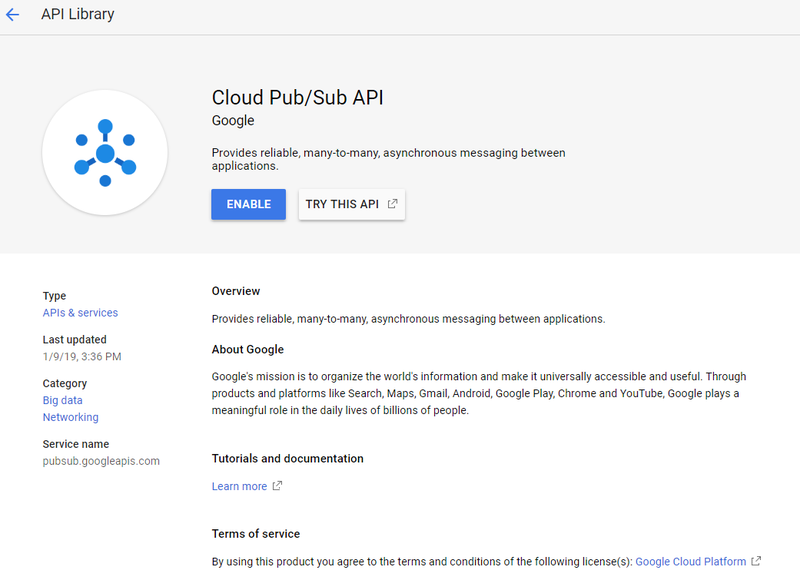 To add in Pub/Sub functionality, I have followed the Google PubSub C# client library reference with application specific modifications. I’ve created a C# console application in Visual Studio for the chat. I’ve also added the Google.Cloud.PubSub.V1 NuGet package and included it within my source file. The code above creates a topic for the General channel (topicId = “General”) utilizing the project ID from the Google Cloud Console. Note that in a normal chat application, you wouldn’t want your users to have the ability to create topics freely. Now that you’ve created your channel the next step is to subscribe to the topic you’ve created. Pull subscription requires the subscriber’s client to initiate requests for messages. 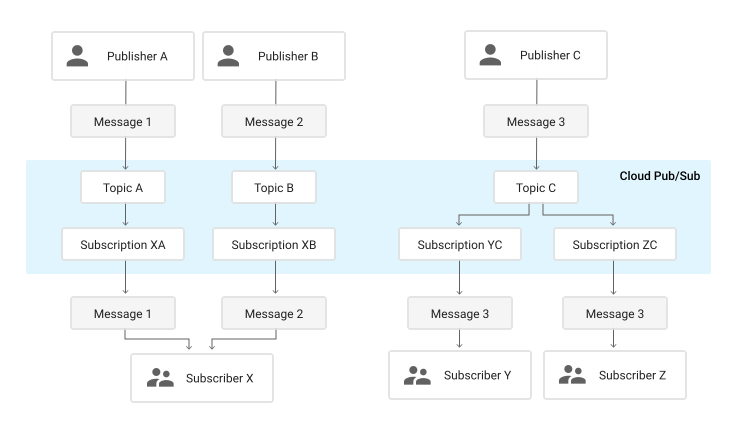 Push subscription will allow Cloud Pub/Sub to initiate requests to subscriber clients to deliver messages. Find more information on pull/push subscription here. Now that we have created a subscription, we will publish a message to our General topic. The code below publishes a message that says “Hello, Pubsub” to Pub/Sub. Using the pull subscription approach, there must be a call to the Pub/Sub server to receive messages. To illustrate this, below is a call to the Pub/Sub server to initiate the request to the generalsubscription on the general topic. It is also important to note that our subscriber stops after receiving one message using subscriber.StopAsync. Feel free to remove this to continue listening but stop listening for messages at some other point in your code. This will ensure you delete the topic and subscription and avoid getting an error should you wish to run it again because of an existing topic. Run the code and check out the results in your console. There you have it! After execution, you should see a message in your console that you received a message posted seconds ago and another message which is an echo of Hello, Pubsub. Had 15 others subscribed to this topic, you would have recreated the game chat I described earlier. There are many other areas to explore to give this solution additional features found in other chats. Stay tuned for more developments and improvements. Developer Advocate @ Google. Gamer. Maker. Trying to make things easier for others by doing the hard stuff myself. Opinions are my own.